Private chauffeured vehicles have traditionally been considered the preserve of the super-rich and famous. However, compared to the cost of first-class rail travel and hotel rates, hiring a chauffeur-driven Mercedes could save you time, money and improve the comfort of your journey. Paul Phillips, who operates Seamless Chauffeur, explains: “We offer a seamless door-to-door experience with onboard wi-fi, power points and a private environment to conduct your business. He adds, “We recently took a client to London for a charity dinner. We picked him up from his workplace and drove straight to London. We then left at 11pm, arriving back in Birmingham soon after. “The cost of first-class rail, taxis, hotel and tube would have been in excess of £500. Using Seamless Chauffeur meant he was home and in his own bed and not losing out on valuable family time. Paul goes on to say that the savings are even greater for group travel. 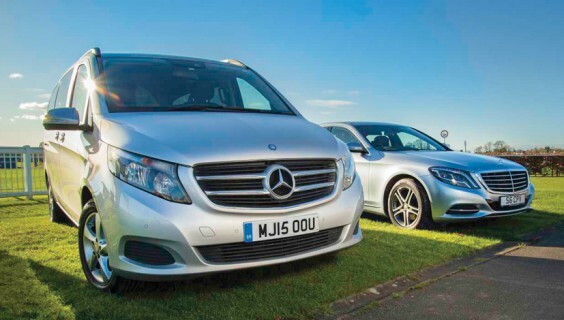 Seamless Chauffeur provides Mercedes V Class people carriers (seven seats) which have conference seating and are ideal for pre-meeting briefings. Each vehicle carries technology to avoid time-costly road delays and can be booked to meet your own special business or personal requirements. Seamless Chauffeur also offers luxury and classic wedding cars for hire along with luxury travel packages for Cheltenham Festival, Royal Ascot, Wimbledon and other such events. Cars for hire include Range Rover, Jaguar and Mercedes.